حوض الأسماك الحقيقي على شاشة سطح المكتب الخاص بك. تقليد واقعي غير عادي لحوض مائي مع مخلوقات بحرية سوف يلفت انتباهك لفترة طويلة ، لأن الأسماك الاستوائية والأجسام ثلاثية الأبعاد الأخرى تبدو حية ، وأصوات فقاعات الهواء التي تندفع تعطي الانطباع عن الصورة المتحركة. 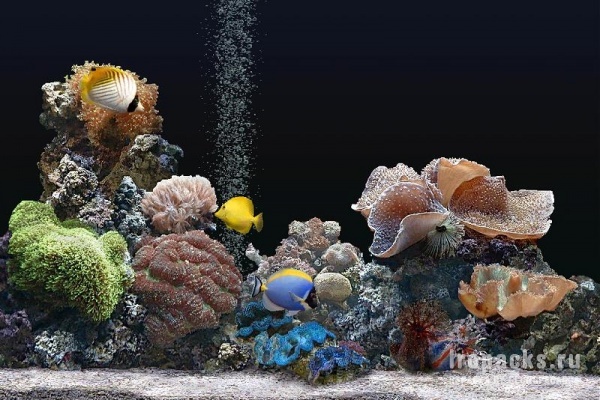 SereneScreen Aquarium is a screensaver which imitate in a realist form a seafloor. Or maybe, rather remember a nice huge Aquarium by the fact that you choose the wildlife that you want swim to your screen. Its realism is given thanks to the design and has a good lighting collated perfectly with the sound. Especially highlights for the perfect movements that executing coloring fish. These fishes in 3D have a high resolution and graphic quality. It additionally incorporates a 'underwater' clock with date and time current. One of the features that this application has more highlights SereneScreen Aquarium with fish in movement is the fact that you can personalize a lot of aspects (clock, sound, fishes, rocks, and so on). You can choose a lot of Marine animals and fishes as you want and see them swim in your screen. There are more over 25 different fishes to choose, included a starfish. Certainly a screensaver when you have it installed you cannot get rid of it. Download now and enjoy see fishes that you have choosen.